If your rose bushes have a few yellow leaves here and there, you may just think that these discolorations are part of the aging process. Indeed, in many cases they are. Some yellow leaves, however, are indicative of serious health problems in your roses, and quick action is needed to save the plant. Knowing what can cause yellow leaves on rose bushes will help you determine how best to care for your plants. Yellow leaves on a rose bush mean that those leaves are not getting the nutrition that they need to remain green. The chlorophyll in the leaves is breaking down, causing them to change from green. This can be a symptom of age--old leaves turn yellow and fall off the bush--or it can indicate that an outside factor is causing the leaf distress. There are several main reasons for yellow leaves on rose bushes outside of natural aging. Blackspot fungus produces black spots with yellow rings around them on the leaves, and other leaves on the plant also may turn yellow and die. Leaf hoppers also can cause leaves to yellow, as can humid conditions. If age is the cause of the yellowing leaves, then the yellow leaves will be mostly at the bottom of the bush. Blackspot fungus leaves telltale black marks encircled by yellow rings on the leaves, even if other leaves are just yellow. Leaf hoppers devour the juice inside the veins of the leaves, causing them to curl up as well as turn yellow. Once you determine the cause of the yellow leaves on rose bushes, it is time to take action to resolve the problem. Old leaves should simply be pinched off and thrown away. Black-spotted leaves, however, must be thrown away completely in a plastic bag and dumpster rather than dropped on the ground. In addition, treat Blackspot fungus with wettable sulfur applications every two weeks. Leaf hoppers can be controlled with the pesticides Malathion 50 or Orthene, which should be applied according to the manufacturer's instructions because every product is slightly different. July and August are particularly stressful months for roses in most climates. 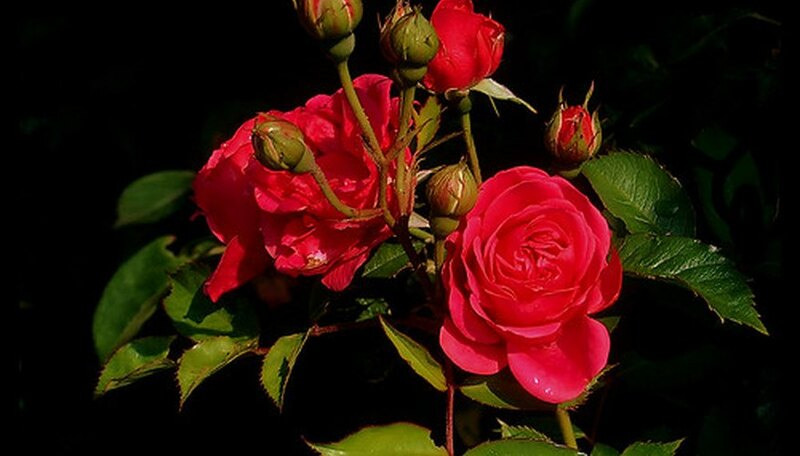 During these months, magnesium or iron deficiencies in the soil can cause widespread yellowing of rose bushes' leaves. Epsom salts and iron chelate worked into the soil can resolve this problem. In addition, too much water can cause yellow leaves as well. If you water more than once a week because the climate is dry in your area, then you may be overdoing it.